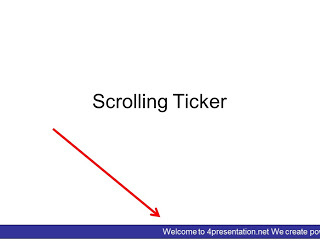 First, add a textbox onto the slide. Type in the news and information that you want to display to the audience. Now, move the textbox off the slide so that it can’t be seen on the slide itself. Place the textbox on the bottom left, just beside the edge of the slide. Click Slide Show > Custom Animation. Select the textbox, then click Add Effect > Entrance > Crawl In. Set the Direction: “From Bottom” to “From Right”. Now, right click on the effect and select Timing. Click on the Speed input field and type in “20 seconds”. You can also set a speed of your preference. Click on the Repeat dropdown field and select “Until End of Slide”. This allows the ticker to scroll forever. Note: that if you want to do this on multiple slides, add the ticker onto the Slide Master (Click View > Master > Slide Master), instead of the current slide.